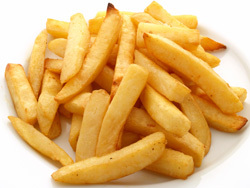 Chips are one of the nation’s favourite foods. The National Chip Week (16th – 22nd February) celebrates this passion in a fun way encouraging everyone to eat chips, vote for their favourite condiment and the best chip shop and to share ideas and recipes. However, with over half of last year’s domestic fires being linked to cooking there is a serious side to this national celebration. Over 3,000 people were injured last year in kitchen fires, many of which involved deep fat fryers. With this in mind we would like to remind everyone planning to cook chips of some fire safety tips. – If possible use a thermostatically controlled deep fat fryer, the thermostat regulates the temperature of the fat and prevents overheating. – Look out for signs of the oil overheating, if it starts to smoke, the oil is too hot. Turn off the heat or remove from the source of heat and leave to cool. – Never cook with oil after consuming alcohol and always attend to your cooking, never leave the room with a pan still cooking. A chip pan can ignite very quickly. ALWAYS supervise cooking with oil. – Should your chip pan ignite ensure that you and any occupants of the house are safe. Call 999 and leave the house, closing doors and windows as you go. – Think of safer ways to cook chips, oven chips and air fryers are not only safer but healthier ways to enjoy your chips this week. Lastly, before embarking on cooking chips and joining in the general celebration of the humble chips, check that your smoke alarms and heat alarms are working. A smoke alarm will alert occupants of a fire, giving them precious seconds to evacuate.